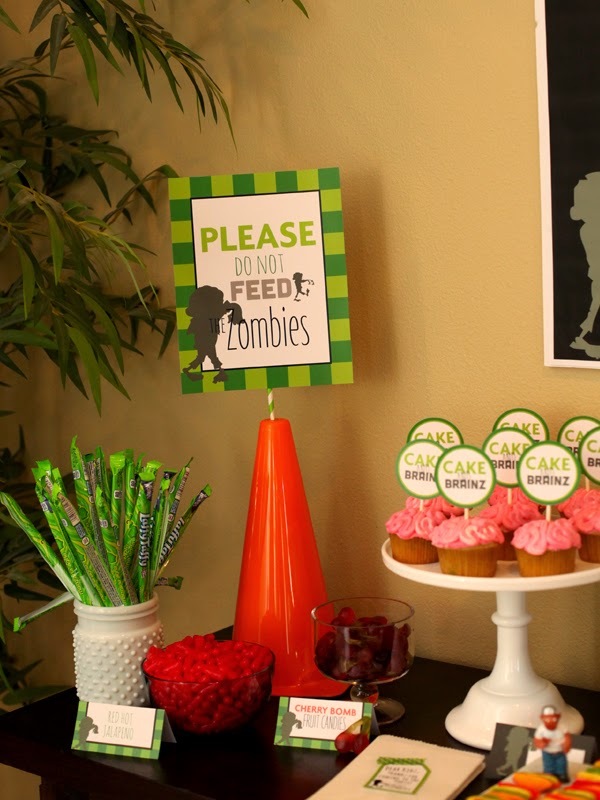 I created this Plants vs Zombies birthday party for my nephew Will for this 8th birthday. We kept it pretty simple since his birthday is around the holidays…. every other day we were having a party- Gingerbread House decorating with 15 little girls, Christmas, New Years and then his birthday (all within a week and a half!). We also wanted to keep the sweets limited as they have been on a permanent sugar high for the last week! These gummy candies are actually Hot Dog gummies…. but no one can tell right? The kids loved them! They were grabbing them by the handfuls. These Cone Head Zombie cupcakes are super easy! 1. Just melt orange chocolate melts & ice cream waffle cones. 2. You want it really runny so I added a couple drops of vegetable oil to the chocolate (this allows it to be easier to coat the waffle cones). The surprise hit was the brain cupcakes… BRAINZ. I thought the pink might throw everything off, but I actually really liked it! Cake and Brainz… who knew they would loves these! The cake was the favorite of all the kids! I bought Plants vs Zombie figurines from Amazon and had Will arrange them how he would if he was playing the game… the only problem is that he wanted like 8 sunflowers! I created this printable House decal to make the cake look more realistic and complete. I just love how it turned out… I added a lithe happy birthday banner and no Zombies allowed sign to make it a festive house. For the cake I frosted it with green frosting then for the squares I used green chocolate. For the games we played a couple really fun ones! The first game we played was The Zombie Autopsy Table. In each bag were “Body parts” and they had to guess what it really was. Like for the heart we used a pealed orange. This was a great first game as they could play while waiting for the other guests to arrive, then when they were done the other kids had arrived and they could have their turn feeling everything. We had a relay race. They had to put on different layers of clothes and a cone hat and run to a certain spot and run back, then the next person had to the same thing…. cone hat and all! We got the cones from the Dollar Store. A surprise guest showed up! When we asked Will what he wanted to do at his party, he said he wanted his Dad to dress up as a Zombie and chase them around. So that’s what we did! A Cone Head Zombie tag game. Once the Zombie tagged you ,you became a Zombie…. every human for them self! Every kid put at least 1 Crazy Dave Tacos on their Lawn Mowers! We had a couple scissors laid out to cut the straws with. I ended up helping most of them with this though. They said the blue frosting was Zombie guts… only boys would come up with that! I even found gummy Zombies for them to put on the lawn mowers and “run over them” They really loved these! OH I just loved it!! Cone Head Zombie Cupcakes are looking so cute. Very well done my friend! I got lots of new ideas for the decoration of upcoming NY events. I cannot wait to use these ideas in my next projects!! Thanks! We had a ton of fun! The boys were in heaven.